Sooo I’m like three months behind. I should be ashamed, but damn I’ve been busy. Started new school programs, been traveling back and forth for work, and oh yeah… I MOVED again. 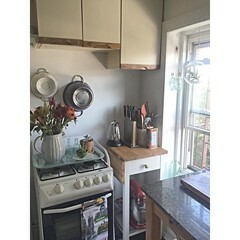 Here, I hung a coat/towel rack and embellished hooks onces used for jewelry to hang my pots and pans, mugs, colander, and dish drying rack (when I wasn’t using it). 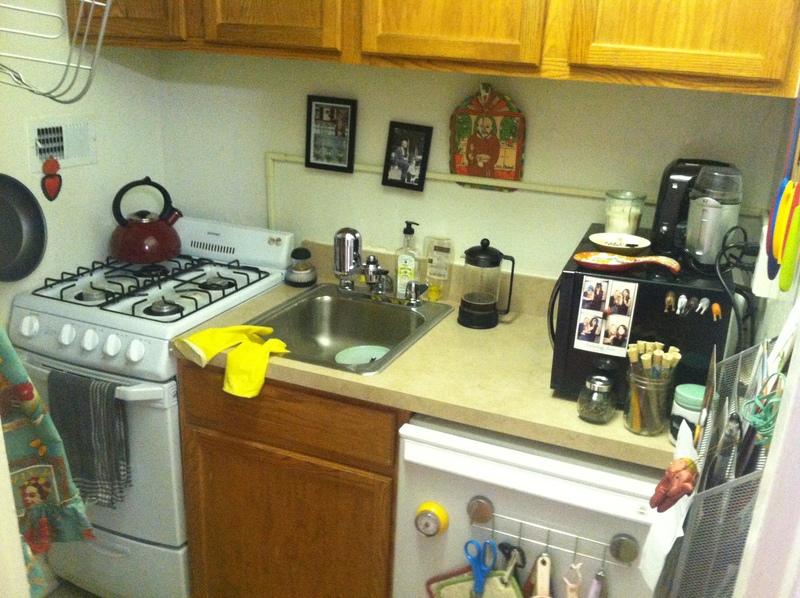 In the middle is an Ikea bathroom shelving unit that I used to store all of my dishes and baking sheets. On top, you’ll see recycled jars I kept to store my silverware. 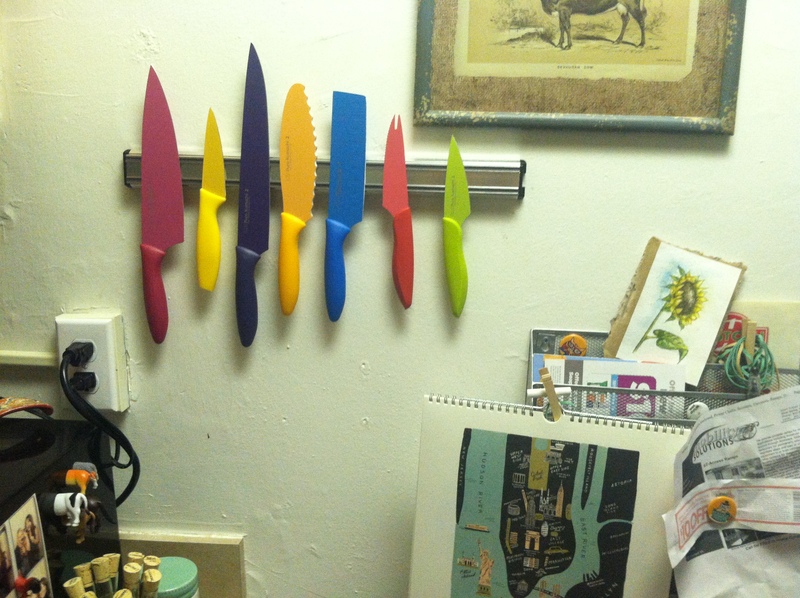 Magnetic knife strip: best. purchase. ever. Ok, maybe not best per say, but seriously, this saved space, and it actually got me using all of them, rather than than just a simple pairing knife. At the bottom right is a metal paper organizer I purchased in college for my desk. I hung it on the wall and actually kept mail, coupons, and recipes in it. 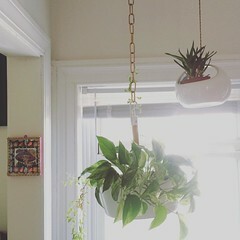 Really helpful, and brought a little more personality to the space. So, that’s the kitch. See at the bottom right, my mini fridge. Perfect for one person. On the front is a magnetic hanging rack that I hung scissors, hot pads, and measuring cups on. It was purchased about a decade ago from the Container Store. Note to future self: Never age yourself by dating your kitchen equipment. 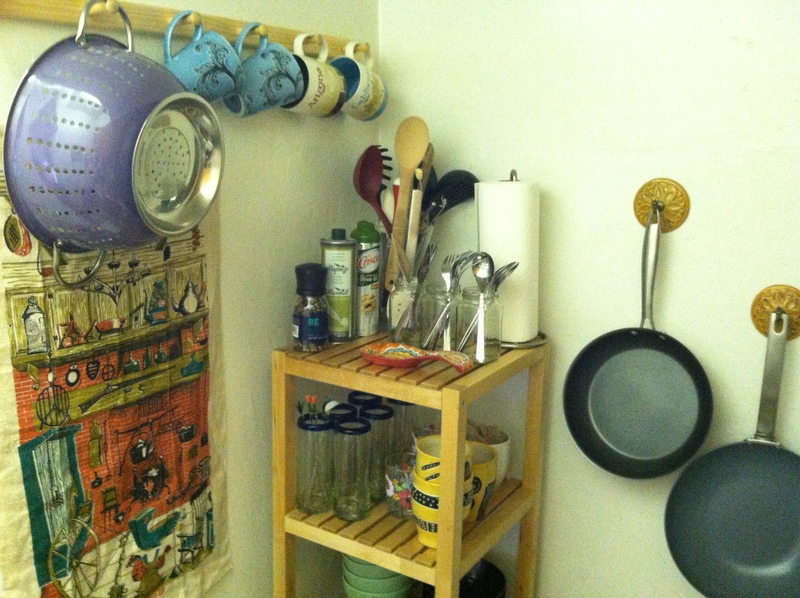 Above the fridge is my favorite DIY item ever – spice rack in a mason jar. When this studio was first built, a murphy bed was up in the closet where my bed is placed. As you can see, the perimeter insert is still there, making somewhat of a nook for my bed. It makes it private. 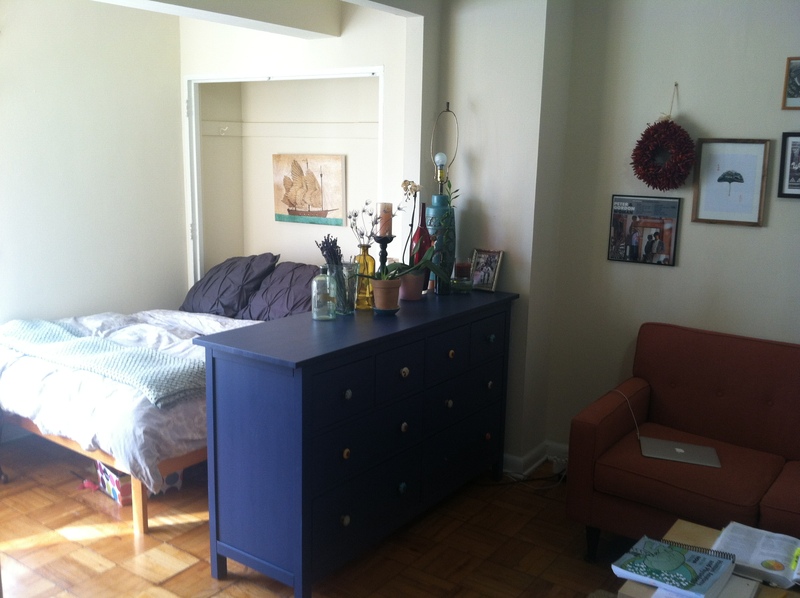 Additionally, I placed my beast of an Ikea dresser as a room divider, between the bed and living area. When you walk in the front door, you can’t see the bed, and honestly, most assume it’s what’s behind the closet door. Win. 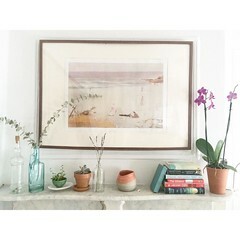 For studios, less is more, and spacing things out the best you can will definitely help. 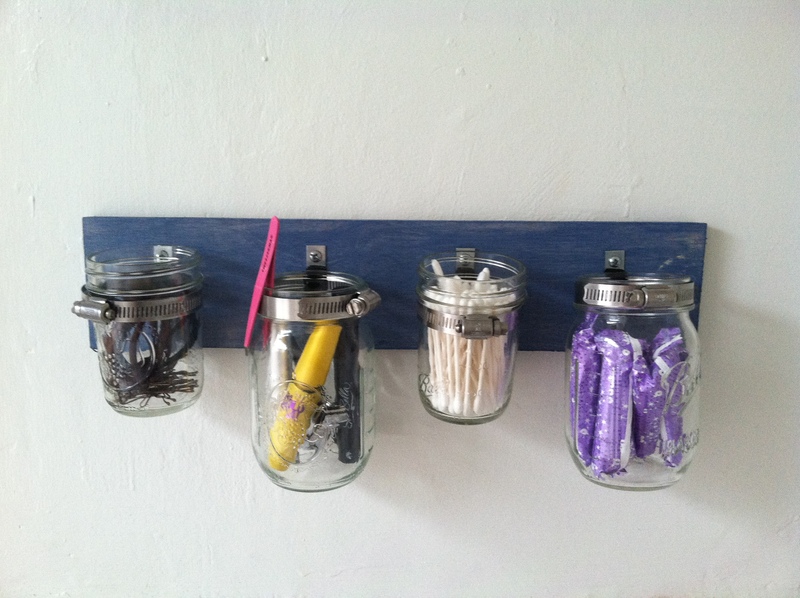 Lastly, you should definitely try and make one of these mason jar racks. They’re WAY fun, super easy to make, great storage, and just plain rad. Cheers to fabulous studio living!